Learn how to install an ink system in the Canon PIXMA MG2140 printer, follow the steps below, the process is free. Canon printers with its ink cartridges, have been given stand out as one of the best for the installation of a continuous ink system. These mostly want to change the picture somewhat implementing new components as the head cover. A door that completely changes the way you install the ink systems on these machines, but always you should look for an alternative, then a post not exactly how to install it, as we all have a different way, but to achieve understanding some of these equipment and to do otherwise. As always we need a continuous ink system, good quality and resistance, check yourself are flexible hoses and tanks have all the accessories, see our publication of a component ink system. This is the first step and one of the most important, we must be very careful in doing so because they can permanently damage the ink cartridges. Drilling for Canon cartridge must be precise and no spaces around, in this way the air will not leak, causing back ink tanks. Should be very careful when filling the tanks, check not put ink in the wrong place, fence fixing cartridges as the progress, place occasionally cartridges before connecting hoses on the printer to see how it will work final. As said before, this is a crucial time, because it can damage the ink cartridges if you put in place that is not right, check the sides good than not spending any air, and put the hoses connected to the cartridge before to put the printer cartridges. As you can see in the picture, the color red is in the middle, left blue and yellow on the right, the black cartridge alone, this is the position and appearance of the cartridges just before connecting to the printer. The hose is the most important, you must connect properly to avoid paper jams and the car, we recommend using a procedure that we have raised in our publication to place the hoses in this type of printer. After the ink cartridges are connected to the system, we must remove the hoses from the printer so that a hole in the printer will need or want you can leave without it. We'll take the hose from the left side, as pictured one end is connected to the cartridge and the other continuous ink system. 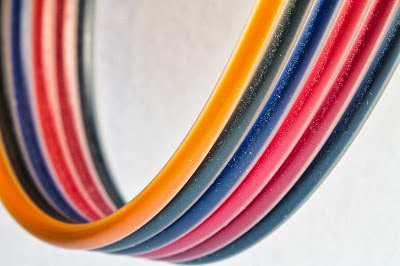 As seen in the image, as it must appear to her after installing the system printer, if you have purchased an ink system with all accessories, has to receive several of these for use on any printer, is a lug hoses that help give a route hoses. If you need any help in this process just type a comment in the publication, with pleasure it will be answered as quickly as possible.